Comprehensive preoperative assessment and correction of inadequacies or deficiencies to the greatest extent possible is necessary to achieve optimal surgical outcomes in elderly patients. Americans’ increasing life expectancy is resulting in a double-edged sword: As longevity increases, so does the likelihood of pathophysiologic disorders, diseases, or trauma that likely will require hospitalization and significant medical and/or surgical interventions. The elderly undergo significantly more surgical procedures compared with younger age groups. In 2006, they underwent 35.3% of inpatient surgical procedures and 32.1% of outpatient surgical procedures, and as the population continues to age, there will be even greater demands on surgical services.1-3 Therefore, comprehensive screening, especially the assessment of nutritional status and intervention in selected settings, has been proposed as an appropriate cost-effective preventive health and safety measure. For example, in a recent review of malnutrition in nursing homes, researchers documented an alarmingly high rate of 30% to 50% protein/calorie malnutrition which, in turn, was associated with increased mortality rates.4 Moreover, much of this malnutrition was preventable or reversible, although some wasting and nutrient deficiencies commonly result from chronic diseases and disorders and cannot be easily prevented or reversed. On the other hand, many studies have demonstrated that malnutrition is neither integral to aging nor is it inevitable with all illnesses. Assess a patient’s cognitive ability and capacity. Identify risk factors for developing postoperative delirium. Screen for alcohol and other substance abuse or dependence. Evaluate cardiac status according to the American College of Cardiology (ACC)/American Heart Association (AHA) algorithm. Identify risk factors for postoperative pulmonary complications and implement appropriate measures for prevention. Document functional physiological status and history of falls. Determine a baseline frailty score. Assess nutritional status and consider preoperative interventions to correct severe nutritional deficiencies. Obtain an accurate detailed medication history, monitor for polypharmacy, and consider appropriate ongoing medication adjustments. Determine the patient’s treatment goals and expectations in context with possible treatment outcomes. Determine the patient’s family and social support systems. Obtain appropriate preoperative diagnostic tests focused selectively on elderly patients. selectively performed chest X-rays and pulmonary function tests. Can you bathe and dress yourself? urinalysis in patients with suspected urinary tract infection, undergoing urogenital surgery, or diagnosed with diabetes. In conclusion, comprehensive preoperative assessment and correction of inadequacies or deficiencies to the maximum extent possible is mandatory if optimal surgical results, safety, and outcomes are to be obtained in the geriatric population. — Stanley J. Dudrick, MD, FACS, is the Robert S. Anderson, MD, Endowed Chair and Professor and medical director of physician assistant studies in the College of Arts and Sciences at Misericordia University in Dallas, Pennsylvania. He also is professor emeritus of surgery from the Yale University School of Medicine and chairman emeritus and program director emeritus of the department of surgery from Yale-affiliated Saint Mary’s Hospital in Waterbury, Connecticut. DeFrances CJ, Lucas CA, Buie VC, Golosinskiy A. 2006 National Hospital Discharge Survey. Natl Health Stat Report. 2008;(5):1-20. Hall MJ, DeFrances CJ, Williams SN, Golosinskiy A, Schwartzman A. National Hospital Discharge Survey: 2007 summary. Natl Health Stat Report. 2010;(29):1-20, 24. Cullen KA, Hall MJ, Golosinskiy A. Ambulatory surgery in the United States, 2006. Natl Health Stat Report. 2009;(11):1-25. Dudrick SJ. Nutrition management of geriatric surgical patients. Surg Clin North Am. 2011;91(4):877-896. Plassman BL, Langa KM, Fisher GG, et al. Prevalence of cognitive impairment without dementia within the United States. Ann Intern Med. 2008;148(6):427-434. Plassman BL, Langa KM, Fisher GG, et al. Prevalence of dementia in the United States: the aging, demographics, and memory study. Neuroepidemology. 2007;29(1-2):125-132. Corrada MM, Brookmeyer R, Berlau DP, Paganini-Hill A, Kawas CH. Prevalence of dementia after age 90: results from the 90+ study. Neurology. 2008;71(5):337-343. Brookmeyer R, Evans DA, Hebert L, et al. National estimates of the prevalence of Alzheimer’s disease in the United States. Alzheimers Dement. 2011;7(1):61-73. Ansaloni L, Catena F, Chattat R, et al. Risk factors and incidence of postoperative delirium in elderly patients after elective and emergency surgery. Br J Surg. 2010;97(2):273-280. Li C, Friedman B, Conwell Y, Fiscella K. Validity of the Patient Health Questionnaire 2 (PHQ-2) in identifying major depression in older people. J Am Geriatr Soc. 2007;55(4):596-602. Steffens DC, Fisher GG, Langa KM, Potter GG, Plassman BL. Prevalence of depression among older Americans: the aging, demographics and memory study. Int Psychogereatr. 2009;21(5):879-888. Marcantonio ER, Goldman L, Mangione CM, et al. A clinical prediction rule for delirium after elective noncardiac surgery. JAMA. 1994;271(2):134-139. Robinson TN, Raeburn CD, Tran ZV,Angles EM, Brenner LA, Moss M. Postoperative delirium in the elderly: risk factors and outcomes. Ann Surg. 2009;249(1):173-178. Dasgupta M, Dumbrell AC. Preoperative risk assessment for delirium after noncardiac surgery: a systematic review. J Am Geriatr Soc. 2006;54(10):1578-1589. Blazer DG, Wu LT. The epidemiology of substance use and disorders among middle-aged and elderly community adults: National Survey on Drug Use and Health. Am J Geriatr Psychiatry. 2009;17(3):237-245. Blazer DG, Wu LT. The epidemiology of at-risk and binge drinking among middle-aged and elderly community adults: National Survey on Drug Use and Health. Am J Psychiatry. 2009;166(10):1162-1169. Hinkin CH, Castellon SA, Dickson-Fuhrman E, Daum G, Jaffe J, Jarvik L. Screening for drug and alcohol abuse among older adults using a modified version of the CAGE. Am J Addict. 2001;10(4):319-326. Robinson TN, Eiseman B, Wallace JI, et al. 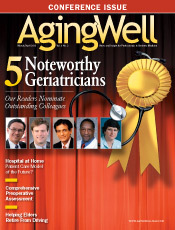 Redefining geriatric preoperative assessment using frailty, disability, and comorbidity. Ann Surg. 2009;250(3):449-455. Hamel MB, Henderson WG, Khuri HF, Daley J. Surgical outcomes for patients aged 80 and older: morbidity and mortality from major noncardiac surgery. J Am Geriatr Soc. 2005;53(3):424-429. Lachs MS, Feinstein AR, Cooney LM Jr, et al. A simple procedure for general screening for functional disability in elderly patients. Ann Intern Med. 1990;112(9):699-706. Fried LP, Tangen CM, Walston J, et al. Frailty in older adults: evidence for a phenotype. J Gerontol A Biol Sci Med Sci. 2001;56(3):M146-156. Makary MA, Segev DL, Pronovost PJ, et al. Frailty as a predictor of surgical outcomes in older patients. J Am Coll Surg. 2010;210(6):901-908. Kaiser MJ, Bauer JM, Ramsch C, et al. Frequency of malnutrition in older adults: a multinational perspective using the mini nutritional assessment. J Am Geriatr Soc. 2010;58:1734-1738. Schiesser M, Kirchhoff P, Muller MK, Schafer M, Clavien PA. The correlation of nutrition risk index, nutrition risk score, and bioimpedence analysis with postoperative complications in patients undergoing gastrointestinal surgery. Surgery. 2009;145(5):519-526.